Home collaborations DC Events You're Invited to the Free People "FP Me" Event! 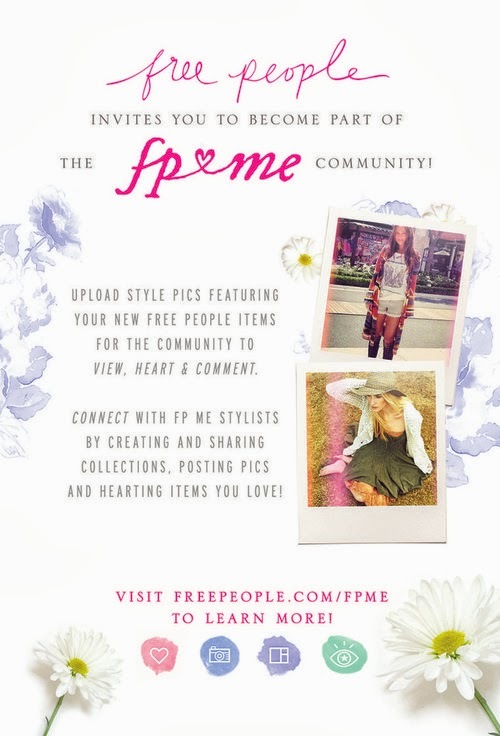 You're Invited to the Free People "FP Me" Event! This Saturday, September 28th I will be hanging out at Free People in Bethesda, MD, from 1-4PM! Come join me to shop, eat candy and refreshments, and play with Free People's newest social media platform called FP Me. There will also be a drawing for a Free People gift card!! You're not going to want to miss it! FP Me is a social community built around you and your style. With FP Me you can share your style and be inspired by other Free People fans by creating and sharing pics, collections and hearts. To join FP Me, simply create an account on freepeople.com or by downloading the iPhone app. On Saturday, I'll be helping you style and upload looks onto FP Me. What will you get with your Free People gift card? Here are 10 items I've got my eye on. Want more info? Like Free People Bethesda on Facebook and follow them on Instagram! Ohhh, sounds fun! I might be taking a trip up to Bethesda for some décor shopping anyway, will have to try to stop by! I would LOVE to see you there!! Hi Tammy, I'm DC blogger as well. What a great blog you have!